IndiaLD extends cheapest calling plan to India : 0.007 $ /min | Free Pc to Phone Calls, Free Voip Calls to India International ! At the end of last year, during Christmas time we discussed about IndiaLD and its new offer to call India. The new year promotion offered cheapest call rates to India at just 0.007 $ (that is .7 cents - less than one cent). This was the cheapest rate to call India and IndiaLd in no doubt is a good voip provider. The promotion was a good hit with a lot of people purchasing the plan. The offer was to end on 15th Feb but IndiaLD has extended the promotion. 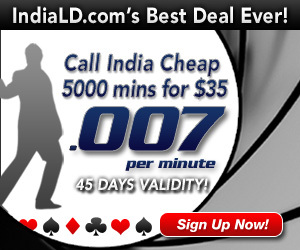 The IndiaLD promotion to call India at .7 cents is still valid. I have had a talk with their customer support and they have confirmed the news. They said the offer is valid now and have not confirmed any date till when it is valid. But for now you can purchase the plan and enjoy the cheapest calling rate. Lets talk about these promotions and benefits in details. Call India Land & Mobile For $.007/min. 45 Day Validity. Recharge Allowed. Call India Land & Mobile For 1.5¢/min. 90 Day Validity. Pay As You Go. Overall since the promotion has been a good hit, if you have not purchased the plan it is still good time to buy it. If you have any queries you can contact their customer support - they have been very helpful. if someone have a a bulk consumption of 5000 mins then, i will prefer to recommend Vonage.. it will cost only $33 a month. At initial appearances, it looks good. But, when you look past the rate per minute, you see that there is a 45-day validity, quite a laugh! Most people will not use 5000 minutes in 6 months, let alone a month and a half! This is a joke! I will stick with Pinless World and Localphone. They have no expiration date at all! I would rather pay 1.8 cents and not have the threat of the minutes expiring.